Whatever your requirements, we can give them shape through sublime furniture and room sets. Whether you need tables and chairs for a lobby or bespoke furniture for serviced offices, we can create it for you. Through our exceptional consultative approach, we put you at the helm of the design process. Following your specifications with undivided attention, we design the furniture you need and craft each piece by hand. Simply get in touch via the contact form below, or call us on 020 3773 1430, to speak to one of our designers. We’ll get to know your requirements and discuss how we can help. Devotion to exquisite design, quality furniture and outstanding service: these are the values that define all our efforts here at Mac+Wood. But everyone has different requirements, and we can do so much more than the purely personal. 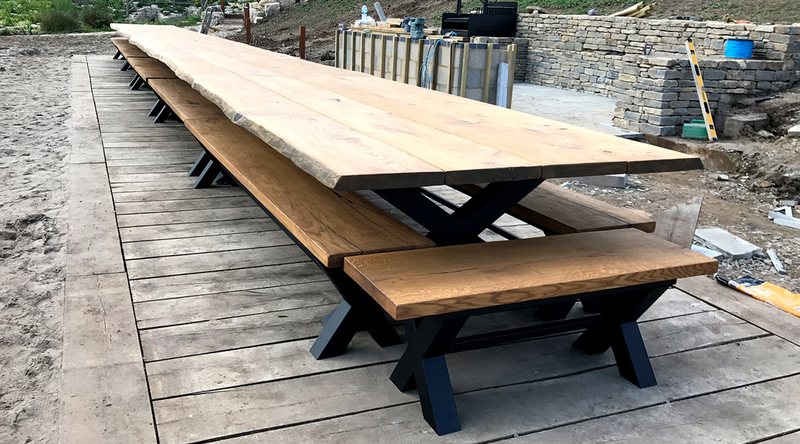 Whatever the size of your order, we will provide the care and attention to detail of true craftsmanship, with each piece created from raw materials, just the same as our individual furniture items. This is our way of showing respect to our clients, and our way of letting you know that, no matter how many items are required, you are guaranteed to receive stunning, high-quality and unique pieces that will endure for decades and beyond. We choose our materials not only for their jaw-dropping aesthetics, but also for their practical benefits. Every item of furniture that we create is easy to maintain and truly built to last: made from extremely tough materials, resistant to scratches, stains, burns and dents, and requiring a simple wipe down to clean, we consider our furniture a smart investment for the discerning commercial buyer. In fact, we’d be surprised if any of our furniture requires replacing or repairing for decades to come. We understand the requirements of furniture set in a public-facing commercial space. It’s not only our materials, but also our design choices that makes our furniture so durable. Strong, simple designs along sound construction principles will enable your furniture to bear up under the roughest treatment and the weightiest strain. With our unique consultative approach, we ensure that you receive exactly the products you require. Our procedure aims to capture your vision and give us a full understanding of what your space needs. The design process also involves choosing the materials that you want to use and the atmosphere that you want to create. Once the designs for all the furniture are in place, we will send you a scaled plan of each piece for you to approve before our talented craftspeople get to work. We pay attention to the smallest details. Depending on the size of the order, we can arrange delivery for them, but for most order sizes we should be able to deliver the furniture ourselves. All our furniture is delivered in two pieces – top and frame – for us to manoeuvre them through your space carefully. Once we have placed the items where you require them, we will assemble them there and then. Would you like to speak to one of our designers about a large order for commercial purposes? Please get in touch today via the contact form below or call us on 020 3773 1430.